Ships dock at a most uninteresting location, 1-1.5 km to the Albert Market. If you insist get a guide to Albert Market, you will see that this is where Black Africa meets the Arab Traders. Taxis are generally available. Gambia is wonderful. Its essentially as the British found it 150 yrs ago and essentially how they left it! Banjul is a somewhat dirty uninteresting place not representative of the rest of Gambia. 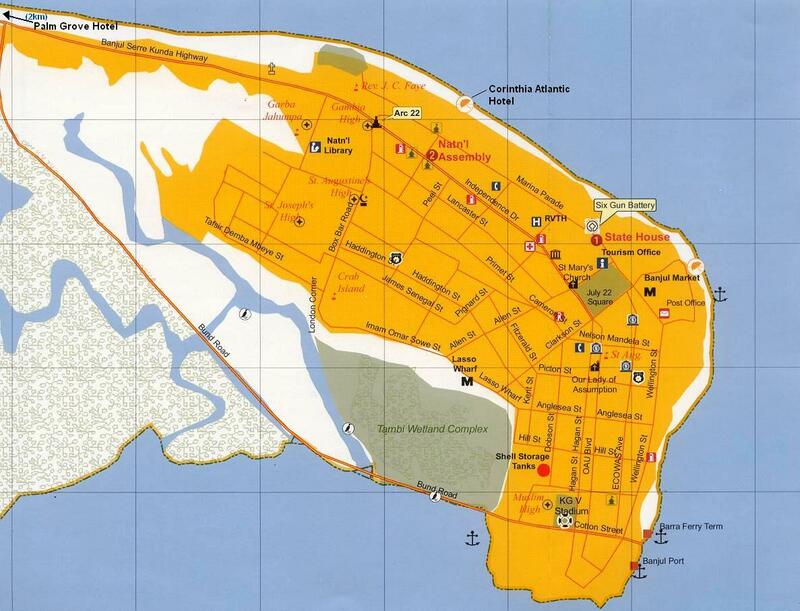 Situated on a sandy peninsula at the tip of Banjul (formerly St Mary's) Island, it is a modern city laid out in grid form, and the capital of The Gambia. Among its chief industries are peanut and fish processing and the production of filigree jewelry and woven fabrics for the expanding tourist industry. Be sure not to miss the State House and the minarets of the King Fuad Mosque as you stroll through Banjul's historic districts. The people are very hospitable to foreigners. Best to take an organized tour (the South Gambia tour and anything in a 4WD Truck would be good as are the River trips) OR take a taxi for a circular drive to the nice Kairaba and Senegambia 4 star Tourist Hotels and hang out. Outside (but secure) is The Strip with sensible cafes and bars, shops and a small nice good value native market. Here you can experience some of the atmospheres that Gambia offers. Make sure your driver takes you through Serrakunda and along the old colonial Fajarrah road past the British Embassy. Brikama is a genuine craft village worth the visit. If reasonably adventurous walk with a sensible guide through Serrakunda Market. Tour operators use comfortable air-conditioned coaches for their transfers and 4-wheel drives for their excursions. For those wishing to adventure out on their own or in small groups, there are three different taxi services in The Gambia. These are mostly painted green and have a "tourist taxi" sign on their cars. These taxis are licensed by the Gambia Tourism Authority and dedicated to serving tourists and other visitors. They are normally parked outside the hotels in the resort areas. They operate on a queue system and have a published tariff for all distances within The Gambia and outside. However, we recommend you to check this with the driver before departure. It is normal to tip these drivers. These are mainly 4-passenger saloon cars painted in these colors, which run a shared taxi service between short distances or parked at the roadside for individual hire (also called a "town trip"). The most common way of traveling in The Gambia for locals is by collective taxis otherwise called "Bush" taxis. These are mainly 7-passenger cars, vans, minibusses and buses. They do not have a single color and they operate a shared service between both short and long distances. They have a set fare. Please ask for the fare before you board the vehicle. They can make several stops on the way to allow passengers to board or disembark. Surrounded by dense mangrove woods, from the city you can visit such exotic locations as the holy crocodile pond of Katchikally, whose water is said to aid fertility. You can also board the simple roofless boats in the Makasutu Nature Reserve and come a little bit closer to the secrets of the thick mangrove wood and learn about traditional folklore in Camp Makasutu. All workers support 10 -15 family members. You will not meet anyone who will not appreciate your discrete generosity. It is a genuinely friendly place; it may seem over friendly but this is the Gambian way and you will soon get used to it. Gambia is poor. Donating a little money is genuinely helpful. Foreign coins are useless; 50 Dalasi is £1, offer 25-50D notes Discretely as you go and this will be appreciated by all. Take old clothes, old T-shirts, any old medicines, pens, footballs etc to give away to an Orphanage or indeed anyone obviously appreciative. Money changer is there as you exit the ship. Avoid using credit cards at locations other than resort hotels. Most stores are open from 9.00am. Some close at 5.00 pm and others at 12 midnight. Most are closed on Sunday.